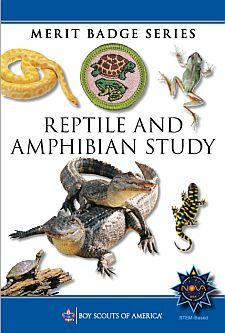 Choose a reptile or amphibian that you can observe at a local zoo, aquarium, nature center, or other such exhibit (such as your classroom or school). Study the specimen weekly for a period of three months. At each visit, sketch the specimen in its captive habitat and note any changes in its coloration, shedding of skins, and general habits and behavior. Find out, either from information you locate on your own or by talking to the caretaker, what this species eats and what are its native habitat and home range, preferred climate, average life expectancy, and natural predators. Also identify any human caused threats to its population and any laws that protect the species and its habitat. After the observation period, share what you have learned with your counselor. NOTE: Scouts must not use venomous reptiles in fulfilling requirement 8a. Species listed by federal or state law as endangered, protected, or threatened must not be used as live specimens in completing requirement 8a unless official permission has been given. In most cases, all specimens should be returned to the wild at the location of capture after the requirement has been met. Check with your merit badge counselor for those instances where the return of these specimens would not be appropriate.